What are the best mounting systems for GPS units? Are you in the market looking for the best GPS mounting system? If that’s the case, we would like to let you know that we’ve done the research for you and concluded that the ChargerCity Hippo Series NonSlip is the product you should consider. This unit will hold your GPS very tight, allowing you to enjoy the drive without worrying your GPS might fall off. The mounting system is fitted for GPS units between four and six inches thanks to its adjustable clip. Its adherence to your car’s dashboard is secured by a non-slip sticky pad that will hold the unit firmly in place. In the unfortunate event you cannot find our first suggestion, or in case you are looking for something different, we recommend looking at the Garmin Powered Suction which is also a great option. Mounting is one of the trickiest issues that come along with our new GPS. Often, we find a great product that comes with a complicated mounting system, an unreliable one or one that is fitted for surfaces where we don’t want to place our GPS, for fear it might be seen or that is too exposed in case of an accident. In other circumstances, an inefficient mounting system or one that takes a long time to install may hinder your GPS’s functionality. If you find yourself in one of the above circumstances, you might find yourself in need of a new mounting system. Nevertheless, don’t panic, you can easily replace your overused mounts with brand new ones by scouting the market and choosing the one that best suits your needs out of all the available options. This product will hold your GPS so tight, it will almost look like trapped in a crocodile’s mouth. In fact, the system bears some resemblance with a predator’s mouth that can be adapted to the size of its prey, as this product is fitted for GPSs ranging from 4 to 6 inches, due to its adjustable clip, thus for many of the products available on the market. To secure adherence to your car’s dashboard, this item is fitted to a non-slip sticky pad that will hold it firmly in place, even if you have a minor accident. 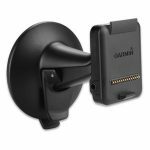 This product designed by Garmin functions using a suction cup that will stick your GPS to your windshield or other available surfaces around your vehicle. As it is designed to hold only 7 inch GPS units in its cradle, you should first check the size of your device before ordering. 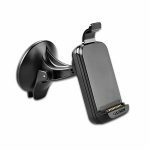 If you are looking for a mounting system for your Garmin Nuvi GPS and you own a truck, van or RV, this is your best option. 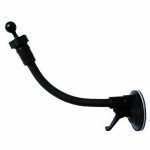 This simple-to-use product is fitted with a powerful suction cup that attaches your GPS to the windshield, but also with a strong, 17mm ball joint that is useful if you have deeper windshields that are not fitted with any type of mounting systems. If it happens that you own a truck, van and RV altogether, have no fear, this mount is easily detachable and moved. 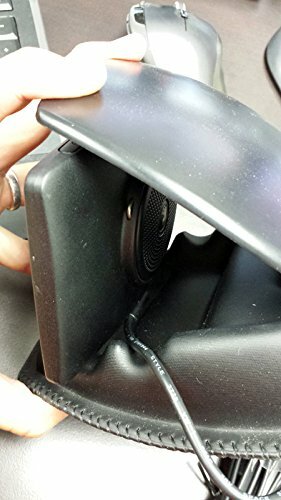 If you want a mount that will not only be easily attached to many surfaces in your car, provided that they are flat, but that will also allow you to power your GPS and improve GPS voice quality, you must definitely take a look at this product, which has been designed for the Garmin Nuvi 37xx and 34xx series.